Different gardening tasks require different types of garden gloves. Get the right pair for your needs with a short read on what’s new for the spring season ahead. Anyone can buy a pair of gloves online. It’s easy, quick & fun… Until you end up with something that doesn’t fit or perform like what you expected. Hype is definitely a tool well used by marketing departments to make a sale. Here I’ll try to simplify some of the details of current hot selling gardening gloves and some of the pitfalls that many have fallen into. A good example is the digging gloves that have really taken off since 2014. 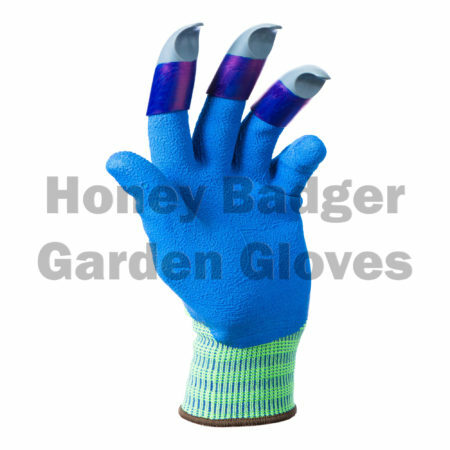 The leading brand is Honey Badger Garden Gloves followed by Garden Genie. I’ll also cover some of the more traditional garden gloves. These have been a favorite of many gardeners for centuries. They are very durable and form to your hands over a period of usage, often there are waterproof rated ones, and they provide great protection against thorns. Rose pruning gloves are often made of leather or ‘man made’ leather. This is a very inexpensive glove that offers very little protection. They are usually made from jersey cotton and will keep your hands from getting dirty when holding tools. The upside is that they keep your hands cool and are washable. Rubber OR Nitrile Coated Gloves: This type of garden glove has the same type of cloth but they have a rubber or nitrile coating on the palm side (Contact areas )of the gloves when you’re gardening. Depending on the type of coating you may have better grip, better abrasion resistance, or better impermeability against water, oil chemicals or other elements. Note that If you’re allergic to latex, Nitirle is a good option. This is a glove that has good abrasion resistance and grip as well. Many of these gloves have other features such as padded palms. These cushions come in handy when doing impact work. Some of the fingertips may have additional materials stitched on, or a thumb crotch stitching as well to prevent the seam of the inside of the thumb from coming undone. Some of these gloves are chemical resistant and use breathable fabrics. Read the details and make sure it fits your needs before purchasing. Gardening Gloves have a new category of hand protection. It’s actually a glove and tool mixed in one. 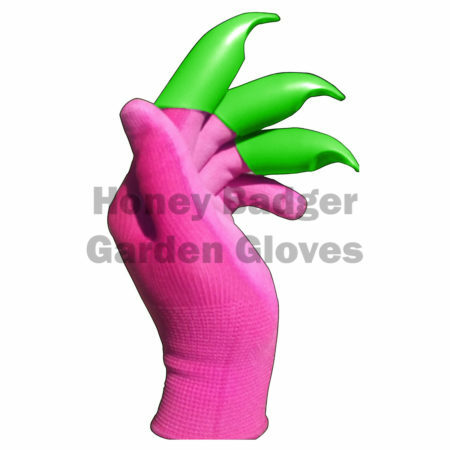 They have claws on the fingers which are very useful for gardening, and they prevent the fingertips from wearing out at the most used areas. 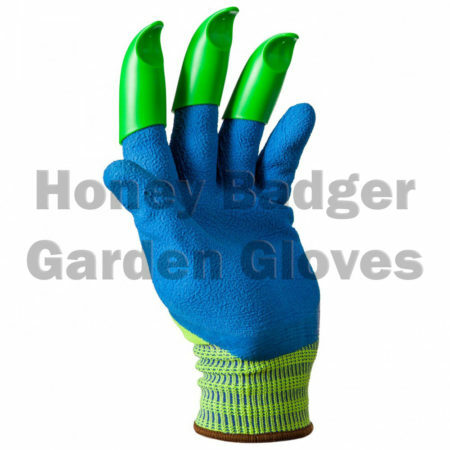 A clever idea invented by Honey badger Garden Gloves in 2012. Recently there have been a lot of hype about these digging gloves and there are many cheap Chinese copies on the market. 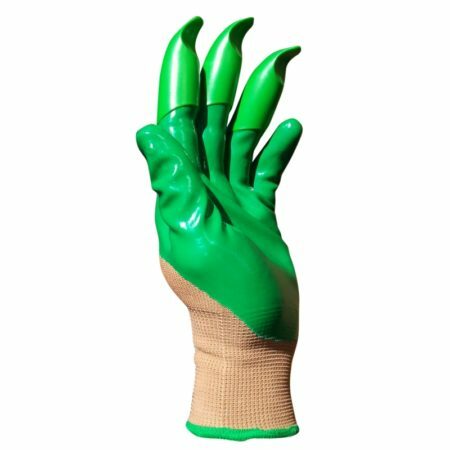 The thing to remember about this type of gardening glove is that the claws MUST be sealed properly all the way around the fingers. Otherwise they can twist during use as pressure is applied. This may injure your fingers… This goes double for arthritic users. These were originally designed for ‘Ease of Use’ certification by the Arthritis Foundation, which is a level of functionality for those who have arthritis. But the Authenticity is important for this kind of product because unauthentic (Knock-off ) products that are produced for a quick sale rarely do any product testing or rigorous Quality Control. They are very useful for many reasons. I often use them for light gardening tasks and daily harvest of vegetables. 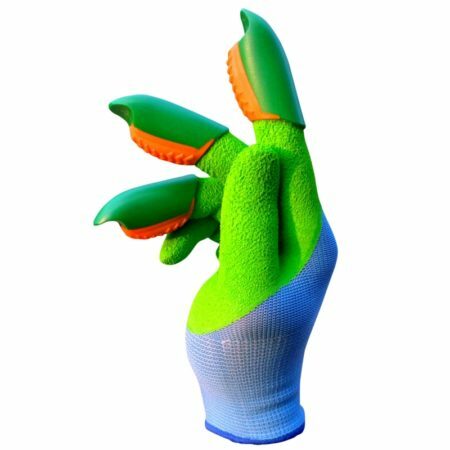 The claws are durable and protect your fingernails with the Patented “Isolation Pocket”. 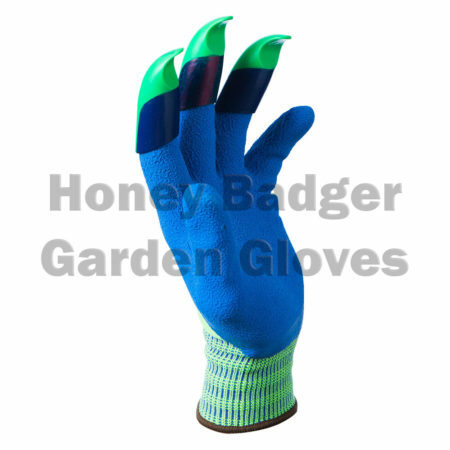 The original Honey Badger Garden Gloves have many size and color combinations and you can even choose which hand(s) you prefer the claws to be on – Right, Left or Both. 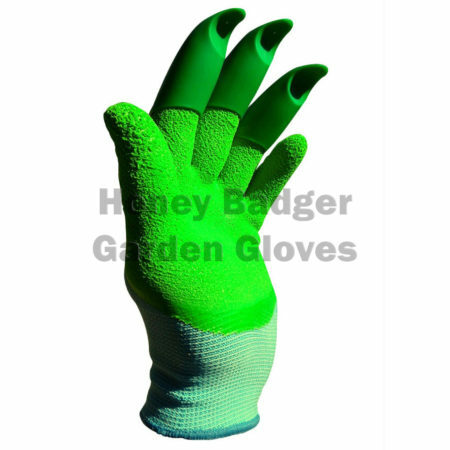 Most of the Garden Genie gloves online are not authentic and offer only one size and color. You can use this link in this article for the Authentic Product. Can you Dig it?! to receive gift card information.